A range of indulgent chocolate spreads made with whey protein, available in 3 flavours. A smooth Milk Chocolate, White Chocolate filled with crunchy cookie pieces & Hazelnut with small chunky real hazelnut pieces. Carb Killa® Spread can be smothered on top of your favourite foods or eaten straight out of the jar. Currently available in 360g jars. What is Grenade® Carb Killa Spread? When the Carb Killa Bars were launched in 2015, they were an instant hit throughout the fitness community. 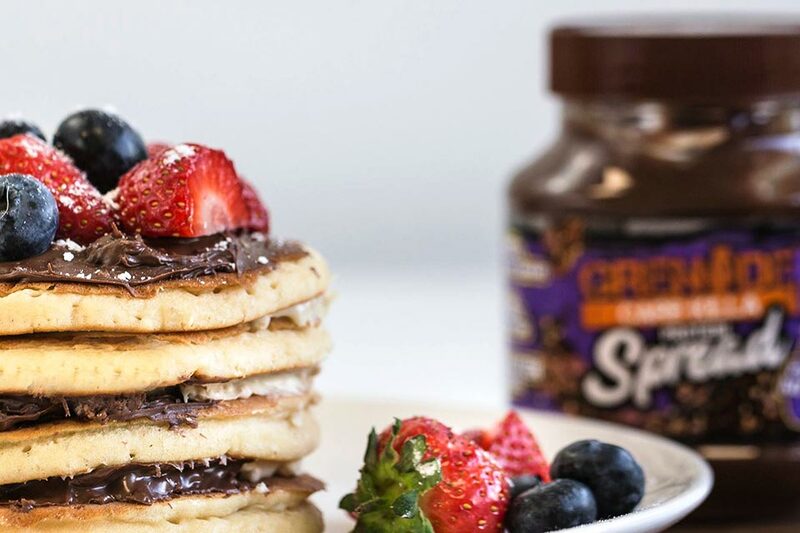 Several, delectable flavours later – along with a score of satisfied customers – Grenade® HQ have once again, come up trumps with their spin-off creation: the Carb Killa Spread. This range of indulgent chocolate spreads features whey protein, and contains 87% less sugar than some of the leading competitors. The award-winning UK label, Grenade®, have developed some of the most iconic sports performance products on the market. Carb Killa Spread is no exception; it’s tailor made for chocolate lovers who want results, without sacrificing enjoyment. Staying true to its form, a 33g serving of Carb Killa Spread provides a mere 1.8g of available carbs, plus 7g of protein. It contains whey concentrate to help stack up your daily macro count, along with scrumptious extras (crunchy cookie pieces, anyone? ), packing in flavour and texture. What’s more, Grenade® have included sustainable palm oil in their recipe – so Carb Killa Spread is good for you and our precious rainforests. Win-win. In conjunction with a healthy lifestyle, the Carb Killa Spread is delicious smothered over fruit, pancakes, crackers etc. – or eaten straight from the jar! What makes its formula special? - Has a wickedly scrumptious taste and texture! How can Grenade® Carb Killa Spread help me reach my goals? When it comes to fitness, progress comes down to two, main factors: hard training and proper nutrition. Consistency is key, but avoiding treats altogether is a little daunting (and unrealistic), to say the least. Carb Killa Spread was made for this very reason – to let you have the best of both worlds! Avoiding a high intake of refined carbs can support you in achieving a healthy body composition – not to mention, your dream physique. For those craving something sweet, this could be a potential pitfall, but it needn’t be. Nutritiously balanced and seriously tasty, Carb Killa Spread is so good, you can enjoy a generous helping without undoing all your hard work. Carb Killa Spread is like having your all-time favourite protein bar… in a jar! Who is Grenade® Carb Killa Spread suitable for? - Men and women wanting a ‘chocolate fix’ – without consequence! - Those familiar with the epic Carb Killa Bar! Vegetable Oil, (Rapeseed, Sustainable Palm Oil), Maltitol, Whey Protein Concentrate (20%) ( MILK ), Skimmed MILK Powder (8%), Fat Reduced Cocoa, Emulsifier: Sunflower Lecithin; Natural Vanilla Flavouring. Allergy Advice; For allergens see ingredients in BOLD.Manufactured in a facility that handles Wheat, Soy & Nuts. Vegetable Oil, (Rapeseed, Sustainable Palm Oil), Maltitol, Whey Protein Concentrate (19%) ( MILK ), Skimmed MILK Powder (8%), Fat Reduced Cocoa,HAZELNUT Pieces (6%), Emulsifier: Sunflower Lecithin; Natural Vanilla Flavouring. Vegetable Oil, (Rapeseed, Sustainable Palm Oil), Maltitol, Whey Protein Concentrate (21%) ( MILK ), Skimmed MILKPowder, Cookie Crisps (6%), ( WHEAT Flour, Sugar, WHEATMalt, Raising Agent: Sodium Bicarbonate; Emulsifier: Sunflower Lecithin; Salt, Natural Vanilla Flavour), Emulsifier: Sunflower Lecithin; Natural Vanilla Flavour. Allergy Advice; For allergens see ingredients in BOLD. Manufactured in a facility that handles Wheat, Soy & Nuts.